The tropical forests, cobalt-blue sea and towering mountains of Maui lure thousands of visitors to this beautiful Hawaiian island every year. But only a few opt to see it from the back of a horse. 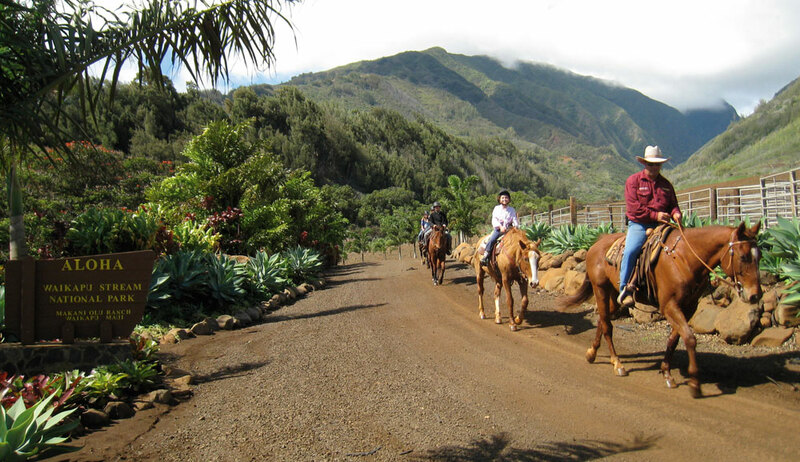 Exploring the West Maui Mountains on horseback is a treat, and the Makani Olu Ranch, just 30 minutes from Lahaina, can provide you with that experience. Managed by horse trainer Yod Neal, the ranch resides on private property and features riding through a variety of terrain, typically in small groups of two to four riders. Guests ride through a working plantation complete with fruit trees and longhorn cattle. The ranch’s two- to three-hour ride takes you through pastures and manicured gardens with plumeria, palms and mango trees. After crossing a stream that comes from Mauna Kahalawai—the Hawaiian name for the West Maui Mountains—you ride through a plantation that is home to Hawaii’s largest herd of Texas Longhorn cattle. “The plantation is peaceful, and riders switch back their way to the top of the slopes, where the bicoastal views of Kahului and Maalaea Harbors take your breath away,” says Neal. “Guests love having the opportunity to ride through pastures with the cattle, and at times see cows with their newborn calves.” The trek also includes riding through the organic farmland of Kumu Farms, where the aroma of fresh basil and rosemary fills the air. Once on top of the valley, you can enjoy a catered lunch and relax to the sounds of rushing stream water from Pu`u Kukui, one of the wettest spots on earth. “Pu`u Kukui is the highest peak of Mauna Kahalwai, and offers majestic views,” says Neal. Riders of all experience levels are accommodated at Makani Olu. All guests are given a horsemanship lesson before mounting, and are encouraged to continue their involvement with horses after they leave. There are horses to accommodate every riding level, from beginner to professional. 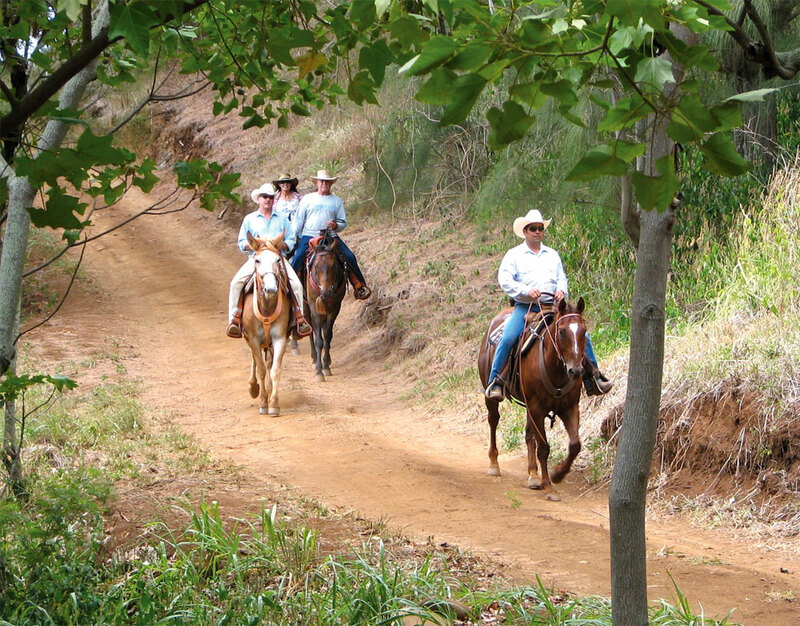 The horses at Makani Olu Ranch are an eclectic bunch, offering riders a range of experiences, according to Neal. “Each horse is selected to meet the needs of the rider, and every guest is accommodated, whether they are a first-timer or a professional,” he says. The ranch features a variety of horses, ranging from Quarter Horses to Thoroughbreds. “They have a wide range of backgrounds and abilities, and include jumpers, barrel racers, ropers and dressage horses,” says Neal. One of the nicest aspects of riding at the Makani Olu Ranch is knowing the horses are loved and well cared for.